Through the cobbled streets of the beautiful village of Hamelin, the Pied Piper is roaming around looking for mice to chase away. This classic tale has been reinvented by Quickspin to give it a modern twist. This slot has a 5x4 reel setup and 40 pay-lines available for you to win on. Pied Piper has become one of Quickspin’s leading titles due to it’s stunning design, imaginative bonus features and medieval soundtrack. Take a trip to Hamelin and see if the Pied Piper will make your visit a memorable one. Learn more here on Easy Slots! Pied Piper’s 5-reel setup and 40 pay-lines are just the start of what can be a brilliant experience. With plenty of base game bonuses on offer, you’ll have no shortage of action when it comes to real money play. 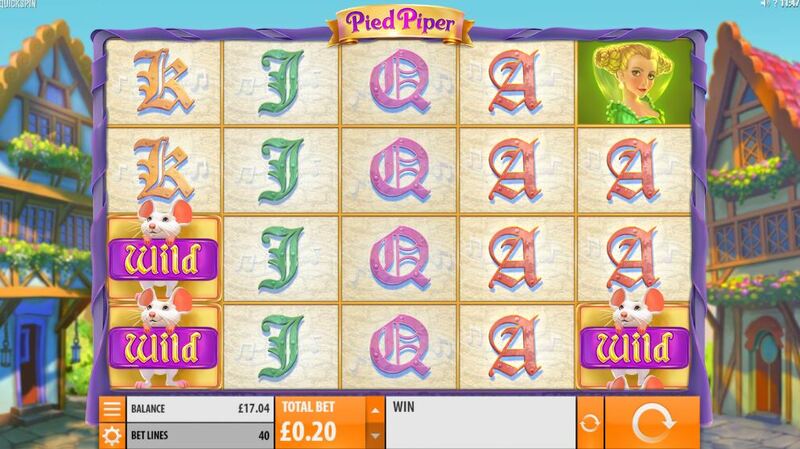 * PIPER RESPINS – You’ll activate the Piper Respins when a Piper WILD lands and fills an entire reel. For every respin, the Piper WILD reel will move one position to the left. 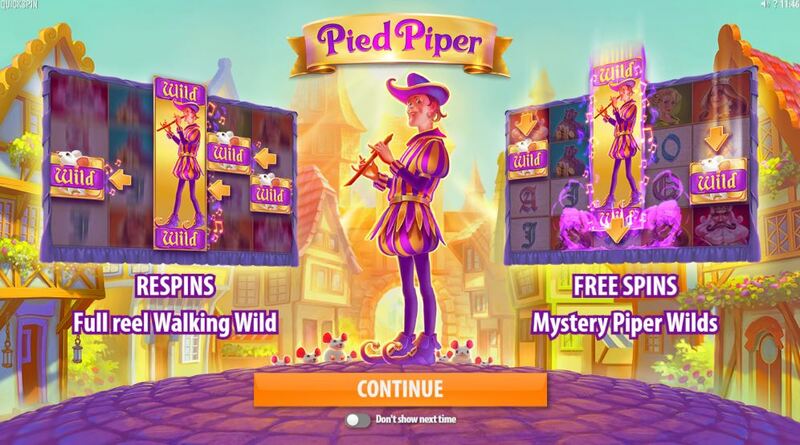 * MYSTERY RE-TRIGGER – When you reach the final spin on the Piper Respins feature, you could potentially activate the Mystery Re-trigger if the Piper Wild appears on reel 5. You’ll receive 5 respins. * MYSTERY RESPINS TRIGGER – After a free spin, a Mystery Piper WILD could appear and trigger the Piper Respins. * FREE SPINS FEATURE – You’ll activate the Free Spins FEATURE by hitting 3 Hamelin SCATTERS. You’ll be credited 10 free spins and between 1 and 6 Mouse WILDS will be randomly added to the reels for each spin. Pied Piper is one of Quickspin’s finest creations and their attention to detail in the design of the game is impeccable. To go with that, you’ve got a variety of great in-game bonuses and a Free Spins Feature with guaranteed wilds.